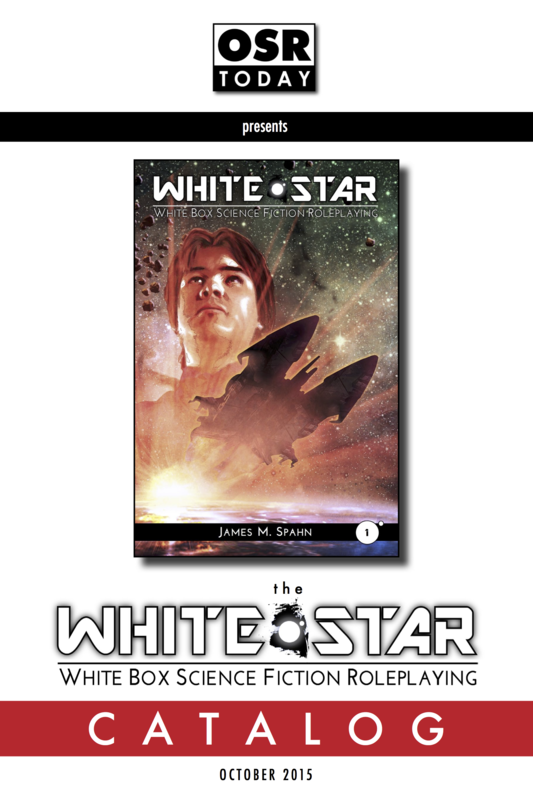 The White Star Catalog is produced under license from Barrel Rider Games and is designed to showcase available products for the White Star: WhiteBox Science-Fiction Roleplaying game. Each monthly issue includes an updated list of White Star-Compatible products that are either standalone or available on blogs or websites -the only caveat being that it must use the WSCL and adhere to the OGL (as the White Star RPG does). New issues of the Catalog will be release on the 15th of each month, with the first release of the Catalog covering October 2015, and the core Catalog being updated on OneBookShelf and a number of other sites (to be determined) to make it easy always have the most up-to-date version of the Catalog. The Catalog is hyperlinked throughout to creator/publisher websites, as well as online stores that sell the products (which the creators provide information on). Product listings in the Catalog are not automatic; creators and publishers who are have created WSCL content and wish to be listed in the Catalog do need to follow the directions given with the Catalog to get their titles included. All entries for a new issue of the Catalog need to be in for the 1st day of that month to be included. This allows time for communication and updating the Catalog. There are also limited cost-effective full-page advertising options available in the Catalog, allowing for a full page ad to be included (and optionally hyperlinked). Details are included in the Catalog.